Messenger Kids was built to give parents more control and to give kids a safer space to message and video chat with close friends and family. Parental controls are core to the Messenger Kids experience, and today we’re launching a sleep mode for the app— a new feature that allows parents to set predetermined “off times” for the app on a child’s device. Parents have told us that they like how Messenger Kids allows them to fully control the contact list and check in on their child’s messaging as they’re learning to navigate the digital world. But parents also told us they would like controls that make the app inaccessible at a certain time, like during dinner, homework time or bedtime. We took this feedback to heart and built a feature that gives that level of control to parents. With sleep mode, parents can set a designated off time and each day at the designated time, the app will “go to sleep” and not be accessible to kids during those hours. Sleep mode is controlled from the Parent Control center in the parent’s Facebook account and the “off times” can be changed at any time. It’s simple to use, and while you can go in and adjust the times at any time, you can also just set it and forget it so you don’t have to worry about constantly monitoring and changing the controls for the app. 1) Go to the Messenger Kids controls in the main Facebook app. Tap on the child’s name, and then on “Sleep Mode” in the App Controls section. 2) Set the times you want the app to turn off for your child. You can set different times for weekdays versus weekends. Once you set the limits, the child will not be able to use the app during those hours. 3) Have a conversation with your child. When you’re setting boundaries around the use of technology, it may be helpful to have a conversation with your child to make sure you have a mutual understanding of the ground rules. This could be a good time to let them know that you’re setting limits for them on Messenger Kids. For more guidance and resources, visit our Parents Portal at facebook.com/safety/parents. 4) Let sleep mode do its job. When the app is in sleep mode, kids cannot send or receive messages or video calls, play with the creative camera, or receive notifications. If they try to open the app, they’ll see a message telling them that it’s in sleep mode and to come back later. 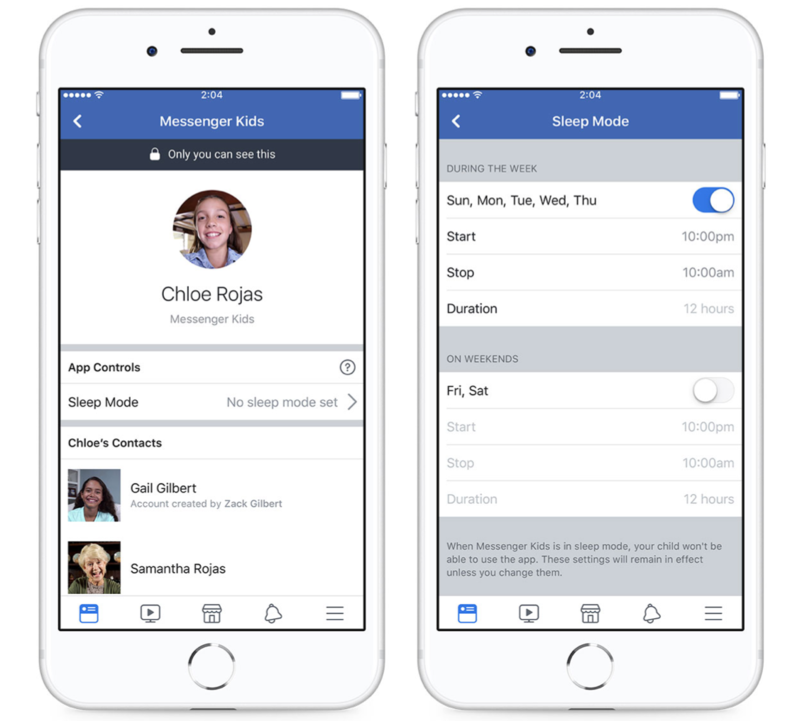 Parents can access all of their controls from the Messenger Kids controls in the main Facebook app. In addition to sleep mode, parents can add and remove contacts, delete the child’s account, or create a new account right from the control panel.